Blog Engage Guest Blogging Contest Winners - I WON! I hadn’t finished enjoying my last contest where I won second prize of $250 and guess what, I have won another one. And this time it is for the FIRST place. If you read my previous posts, then you may know that I shared that I have participated in another (my second) online blogging contest over Blog Engage. My contest entry was How did I get 380+ comments on my first guest post?, that first guest post has got 400 comments now. I got 423 comments on this one and still counting. The post has been chosen as the winning post. I have got the first prize in that contest. There were many participants. All were awesome and really competitive. Here is the list of all the winners. #1. In first place ($250 USD) – Abhi Balani with How did I get 380+ comments on my first guest post? #2. In second, ($150 USD) is Dragon Blogger with Should You Give Up on Blog Commenting? #3. In third ($100 USD) we have HollyJahangiri with All My Contest-Winning Strategies Revealed – for FREE! #6. In sixth place for (25 USD) we have Lisa Patb with 4 Ways You Can Start THAT Blog Today! I would like to thank each and every friend, Twitter follower or Facebook fan, and whoever helped me in this contest even if it was just a single like, comment, tweet or whatever. This could not have been possible without the help of all of them. 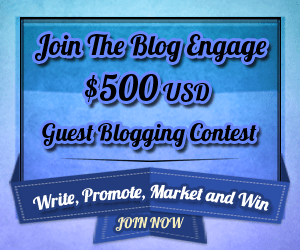 Blog Engage will be up with the next contest of $650 in a few days. Maybe, tomorrow. And at the end of the year, the final contest will be of $1000. So, get ready to participate. Don’t worry the WINNER is having rest here. Hehe.. And not participating in any contest. BUT… only Blog Engage members can participate in Blog Engage’s Guest Blogging Contests and these contest are going to be hosted the whole year, one after another. So, make sure to sign up for Blog Engage (affiliate link, use MINE :), why not? ), a one time sign up fee is necessary to join the blogging community. If you want to know why you should sign up for Blog Engage, then you can have a look to my article: Blog Engage- Right place for Blog Promotion and with that you’ll get so many chance to participate and win contests. Thank you Justin and Holly, for giving me a tough competition and having a great time with me during the contest. Justin is sponsoring next Blog Engage contest and Holly? She has participated in another contest. Don’t forget to connect with OddBlogger.com. There are many options to connect or just subscribe to feeds. Awesome articles you might have missed! Congratulations!!!! I am so proud of you. It is amazing to see how you have gone from a serious newbie to a big time blogging mentor now. You are showing people how to rock the blogosphere by promotings, commenting, engaging, and most of all – by providing VALUE!! You’re awesome and you will go even further with your videos and design work too. All the best to you. Cheers! You know what, you actually don’t know, how much this of your comment matters to me, maybe more than winning a contest. I’m so glad that YOU, yes, Ileane Smith is proud of me. And yes, I did leave that newbie tag when I just entered in the first contest. Thanks a lot for all your appreciation. I’m more happy now, after your comment. Congratualtions Abhi! Like what I said in BE. Your work hard to be in the top and you totally deserved it! I just felt too bad in your CP. Awesome Job Abhi. Got two posts going out today on each of my blogs both shouting out to your win. I just put my new article for the next one into BE (saved as draft and ready to go live as soon as brian officially announces it…) Even got my “qualifying post” on my blog all set up and ready. Just gotta paste in the sponsor links and publish. Haha…. James, I can feel your excitement. Which post you are talking about? Please, make sure to throw me a link of your post where you have mentioned me, on Facebook or comments… I would love to hear. Congrats, sorry about your stolen phone that really does stink. Yeah, I was feeling really bad for my phone… But thanks for your wishes. Good to see you here appreciating me. Well, thanks a lot. Congratulations!! Bro you have just done awesome job with your Hard Work. Keep Posting and Always Do Blogging. Thank you very much, Varinder! I am so happy for you! You deserve it with all the hard work you put in. But so sorry to hear about your phone. 🙁 I know my phone ranks pretty high in valuables I own that go in my purse and would be LOST without. I hope you can get a new one for a good price. Thank you very much for your wishes and support. Yeah, I will try to get a better phone soon. Hi Abhi congrats on winning the contest buddy! I just launched out May contest will you be joining us again? your hard work has paid off my friend well done for sure. Thanks a lot for your wishes. It’s really good to hear that I deserved it, from everyone. But I didn’t thought that I will beat Justin. And I told you, I don’t think I will be joining this time. I have engineering exams ahead. But I will surely help you to promote the contest. Thanks a lot for your kind words and wishes, my friend. Yeah, I’m feeling bad for phone, too. But thanks for your suggestion, Holly. Congrats for the win, wish you would have installed a recovery software in your phone. Since when, there is a fee associated with BE membership ? Thanks for your wishes and BE asks for fee from a long. Hey Abhi Congratulations! Wow amazing you won the contest. I’ve seen how did your work hard in the contest, its really hard to engage with bloggers respond to every comment, sharing the post on social sites, but you done a great job and finaly you got winning! Don’t worry about phone, get a new one and celebrate your winning. Thanks a lot for your wishes and your support my friend. Congratulations to the winners! I just hope I saw this contest before so I have the chance to join and win as well.. Congratulations for the successful contest! WAY TO GO ABHI!!!!!!!!!! You’re on a hot roll! 🙂 You work hard and you should be proud! Im so glad to hear you won, enjoy! Hearty Congratulations to the winner. Abhi after read your post i am also interested to participating in Blog Engage contest. Thank you for your wishes, Janmejaya! Thanks a lot for your wishes. I am glad you stopped and congratulated me. Congrats Abhi … I really enjoyed reading your entry ! Thank you for your wishes, Sachin! Oh that’s really great to know and congratulations brother for winning it with a bang 🙂 i always wanted to participate in such guest blogging contest but i never do so because of my not so good English 🙁 yes i admit and i am trying my level best to improve it. but really happy to for you and all the best for future contest also. you can provide us tips regarding how to participate and win such contest so that a newbie like me can also get some idea. Thanks a lot for your wishes, Brother. And yes, I think I should write an eBook for my strategies. Congratulations Abhi for your prize but its really sad to read that you lost your mobilephone too. Any ways it a part a part of life. Congrats for your 2nd victory in blogging contest and hope you best of luck in advance for next Blog Engage contest. Thanks for all time support, brother. Way to go Abhi. You have gone a long ways, but I do know that your efforts have played an important role in winning the contest. Congrats and keep it up. Like Ileane, I am happy and proud to see you moving up the “ladder”. That’s the spirit. Thanks a lot, DiTesco! I am really happy to hear that you are proud of me, too. Yes, I put all my efforts when I participate in the contest. But to be honest, it’s impossible to win, without FRIENDS. Thumbs up ,chum.I am really excited on your second vistory.One day you will be a blogging academy,i believe. Hey Abhi Kudos! Wow awesome you won the oppose. I’ve manifest how did your design harder in the oppose, its dead harder to plant with bloggers adjudge to every comment, brass the upright on diverting sites, but you through a superabundant job and finaly you got successful! Don’t disconcert most sound, get a new one and bless your winning. Wish you physiologist of fortune for next contest! Thank you for your =kind comments. Of course, I will help you, too. It;s really good to hear that you can help me. Oh, I am already commenting there without knowing it was yours. I love your comments, too. Keep commenting there. Nice to see you here. And thank you.